Ely Choral Society has grown from being an adult education class in 1961 to a choir of some 125 mixed voices today. The Choir takes its singing seriously, but there is a strong social side and lots of fun. Lasting friendships are often made and the Choir warmly welcomes new members. Whilst the Choir has a policy of being an un-auditioned community choir, our standards are high. We perform a wide and exciting repertoire ranging from traditional classical works to modern and specially commissioned pieces. Each year we give at least one major concert in Ely Cathedral and other concerts are held in local churches and schools. During the summer months, members of the Choir have also undertaken tours in Europe. A few years ago we set up our Youth Choir to provide free choral training for local young people. Both groups rehearse on Monday evenings in term time. See the Join page for more information and the Members page for dates. Andrew Parnell has conducted choirs and orchestras since his student days in Cambridge. For 25 years, he lived and worked in St Albans, as Assistant Master of the Music at the Cathedral (where he also founded the Abbey Girls Choir), as Choral Director at St Albans School and Conductor of the City’s Symphony Orchestra. Highlights during that time were Verdi’s Requiem with St Albans School and St Albans High School; Bach’s St Matthew Passion with St Albans Bach Choir; Britten’s War Requiem and Berlioz’s Te Deum with combined local societies. He also directed the Cathedral Choristers in a performance and recording of Orff’s Carmina Burana with the LPO conducted by Franz Welser-Möst at the Royal Festival Hall. Andrew often directed or played for the BBC Singers in Radio 4’s Daily Service. As an organist, he performed in Cathedral services; high-profile special occasions, often attended by royalty; foreign tours; recordings; broadcasts on radio and TV; and solo recitals both home and abroad. Conducting has remained a major part of Andrew’s three-fold career after he turned freelance in 2001. 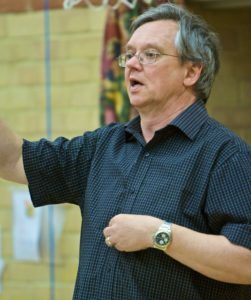 In addition to Ely Choral Society and Ely Youth Choir, he conducts the Wymondham Symphony Orchestra, and has directed the Cambridgeshire Choral Society and the St Albans-based chamber choir Carillon. In addition to conducting, Andrew’s present career sees him playing the organ either in recitals, or deputising at cathedrals around the country. These have included Ely, Canterbury, Wakefield, Rochester, Peterborough and Southwell. Andrew’s compositions, sacred and secular, choral, instrumental and orchestral, have been performed in the UK and abroad. He has written major works for Ely Choral Society and Cambridgeshire Choral Society which have been performed in Ely Cathedral and King’s College Chapel, Cambridge. Fenland Images, commissioned for the 2017 Isle of Ely Arts Festival, was performed in Ely Cathedral during the concluding concert of the Arts Festival in July 2017. Everyone Sang, for choir, organ and clarinet, was premiered in October 2018. Andrew specialises in working with amateur music-makers, encouraging them to enjoy their singing, while they develop their skills to the highest standard of performance and is often invited to run choral workshops. The following members of Ely Choral Society are listed as Trustees on the Charities Commission Register at www.gov.uk/government/organisations/charity-commission: Colin Batchelor; Clarke Brunt; Elisabeth Every; Cheryl Granville; Roger Hill; Elizabeth Jones; Linda Rogers; Frances Sell; Annette Norman and Roger Young. If you would like to join the choir or support Ely Choral Society through our Friends or Sponsorship we would love to hear from you. To be placed on our mailing list please email Roger Hill who will send you information about our future concert programme.